Human PD-L1, Llama IgG2b Fc Tag, low endotoxin (PDL-H5250) is expressed from human 293 cells (HEK293). It contains AA Phe 19- Arg 238 (Accession # Q9NZQ7-1). This protein carries a llama IgG2b Fc tag at the C-terminus. The protein has a calculated MW of 53.0 kDa. The protein migrates as 65-95 kDa under reducing (R) condition (SDS-PAGE) due to glycosylation. Less than 0.01 EU per μg by the LAL method. 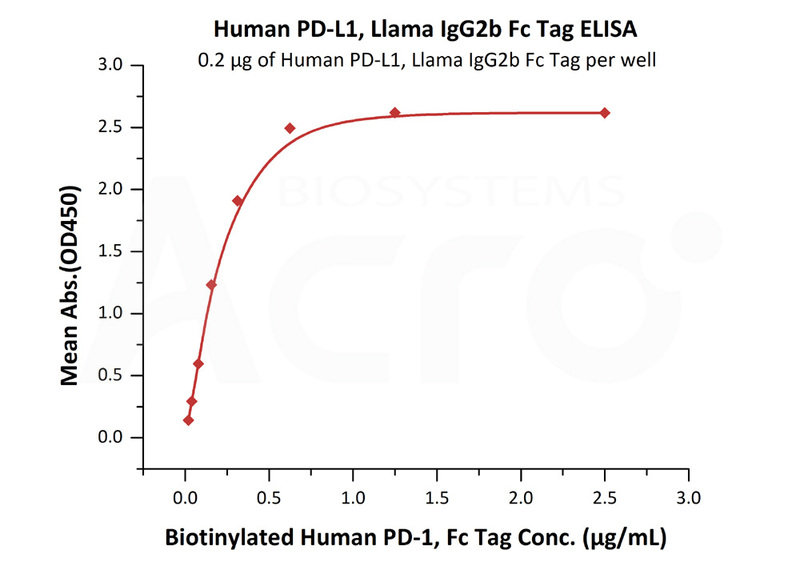 Human PD-L1, Llama IgG2b Fc Tag, low endotoxin on SDS-PAGE under reducing (R) condition. The gel was stained overnight with Coomassie Blue. The purity of the protein is greater than 95%. Immobilized Human PD-1, His Tag (Cat. No. 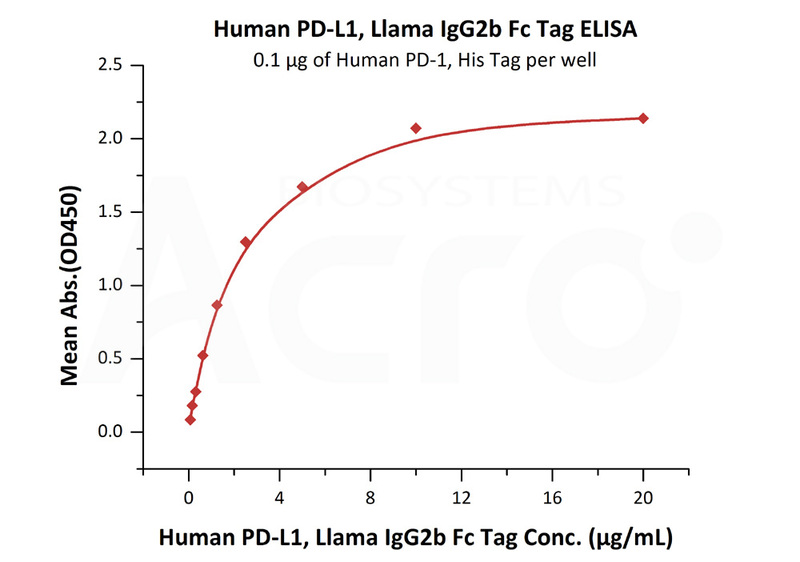 PD1-H5221) at 1 μg/mL (100 μL/well) can bind Human PD-L1, Llama IgG2b Fc Tag, low endotoxin (Cat. No. PDL-H5250) with a linear range of 0.078-2.5 μg/mL (QC tested). Immobilized Human PD-L1, Llama IgG2b Fc Tag, low endotoxin (Cat. No. 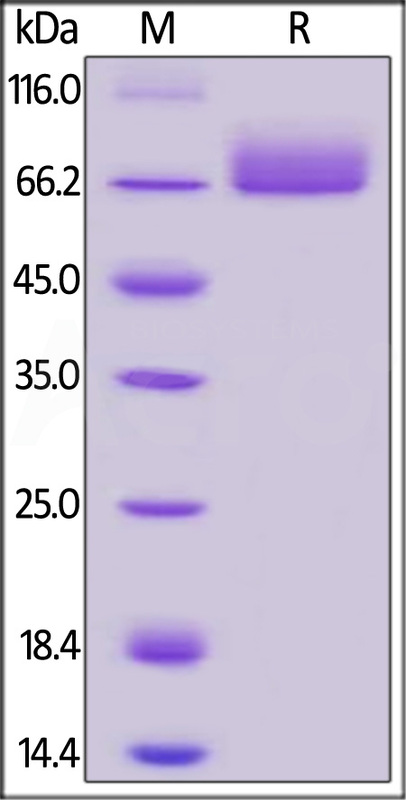 PDL-H5250) at 2 μg/mL (100 μL/well) can bind Biotinylated Human PD-1, Fc Tag (Cat. No. PD1-H82F1) with a linear range of 20-313 ng/mL (Routinely tested). Please note that there may be a cross-reaction between anti-human IgG Fc antibodies and llama IgG Fc tag, also between anti-llama IgG Fc antibodies and human IgG Fc tag. Programmed cell death 1 ligand 1 (PDL1) is also known as B7-H, B7H1, MGC142294, MGC142296, PD-L1, PDCD1L1 and PDCD1LG1,which is a member of the growing B7 family of immune molecules and is involved in the regulation of cellular and humoral immune responses.PDL1 is a cell surface immunoglobulin superfamily with two Ig-like domains within the extracellular region and a short cytoplasmic domain. This protein is broadly expressed in the majority of peripheral tissues as well as hematopoietic cells. Interaction between PDL1 and its receptors belonging to the CD28 family of molecules provide both stimulatory and inhibitory signals in regulating T cell activation and tolerance. PDL1 may inhibit ongoing T-cell responses by inducing apoptosis and arresting cell-cycle progression. (1) Dong H., et al., 1999, Nat. Med. 5:1365-1369. (2) Freeman G.J., et al., 2000, J. Exp. Med. 192:1027-1034. (3) Nishimura H., et al., 2001, Trends in Immunology 22:265.